Get a load of this – not only was the first bottle found (promptly I might add!) – and not only was it found by scientists(!) – it was found by scientists who have written a paper about using art to teach science. It seems like a set up, it’s so perfect. Along with very nice responses, they were kind enough to bring the bottle back to where they found it, in order to recreate the moment of discovery! My great thanks to Nancy Jackson, who is a professor at New Jersey Institute of Technology, and to Karl Nordstrom, a professor at Rutgers. 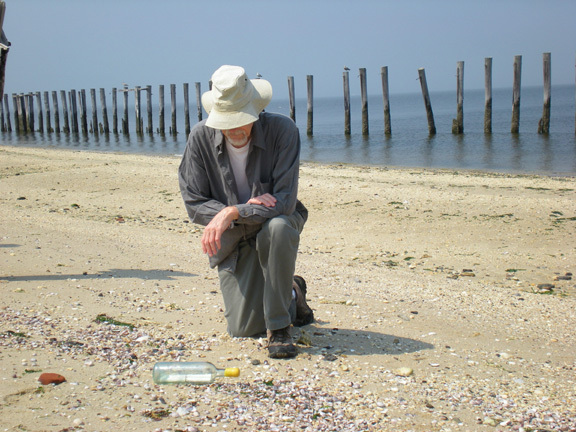 They are coastal scientists and they are conducting a study for the National Park Service to assess the effects of coastal structures on habitat mobility in response to sea level rise. I still can’t get over the fact that environmental scientists who have written about using art to teach science found this. It’s not like I had a particular audience in mind for this project, but this is pretty perfect.